Yesterday it was announced that the Dalai Lama was retiring, more specifically, stepping down as Tibet's political leader. We talked to Robert Thurman, president of the Tibet House here in New York, about what this really means. 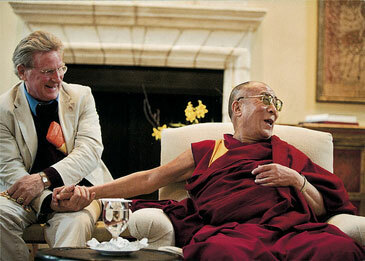 This is a unique situation and Thurman tells us to keep in mind there is a difference between "succession" of a political leadership role moving from a spiritual leader to an elected leader, and "succession" of a reincarnating lama by dying and being found again after subsequent rebirth in another family. I was wondering if you could explain what this retirement means for the Tibetan people. It makes them very anxious, though they are aware that he wants them to take responsibility for the democratic exercise of their citizen's duties. He is only giving up political decision making—he is still there in a moral leadership role, and in spiritual role. Who will now succeed him? The government in exile has a constitution that vests authority in elected representatives. An elected prime minister will take ultimate responsibility for political decisions, in consultation with cabinet and assembly. And is this the first time a Buddhist leader has stepped down? He was a unique case of a Buddhist spiritual leader also being a head of state, since the founding of the Dalai Lama government in 1642. So there is no spiritual leader succeeding him, since the Tibetans have created a secular democratic state in exile, to be imported back into Tibet when the time comes. I read that China maintained that it was not for the Dalai Lama to decide about his own successor, including any possible abolition of the institution. This has to do with the reincarnation of the spiritual teacher line of enlightened Dalai Lamas. Dalai Lama's 1 through 4 had no political power, were merely reincarnate lamas who served as heads of monastic universities and spiritual teachers. The Chinese communists, who do not believe in reincarnation, insisted that they would recognize reincarnations. They began this with the Panchen Lama, who was recognized by the Dalai Lama in the 90s, after which the PRC government abducted and imprisoned him and his family, and then they appointed the child of a party official as the Panchen Lama. Almost none of the Tibetans respect that appointed Lama and he is clearly just a puppet of the state. Is it possible he will not be able to retire? It is possible that in the future, after the 14th Dalai Lama passes and the Fifteenth is found in exile or by the proper Tibetan religious authorities, that the Tibetan people will make an effort to ask him to sertve as the ceremonial head of state, though it is doubtful the reincarnation will agree, as he will remember (or learn about) his previous incarnation's determination to develop Tibetan democracy and a secular Tibetan government. In sum, this announcement by the Dalai Lama is not new news, in that he has made the statement about retiring from politics and the Tibetans' need for democratic decision making, often in recent years, beginning in the 60s. What is perhaps new is the formality of this statement at the time of the election of the new Prime Minister. BEIJING—The Dalai Lama said he plans to formally step down as political leader of the India-based Tibetan government-in-exile in an effort to further democratize the Tibetan refugee community and combat potential efforts by China to hijack the succession process. The 76-year-old monk, who fled to India after a failed uprising against Chinese Communist rule in 1959, has for several years declared himself unofficially "semiretired" from political leadership, while retaining his more significant role as the Himalayan region's spiritual leader. The Chinese government sees him as a separatist. Having ruled his homeland as a god-king, he established a parliament-in-exile in the northern Indian hill station of Dharamsala in 1960, introduced a draft constitution three years later, and in 2001 oversaw the first direct election of a prime minister, known as the Kalon Tripa. But the Kalon Tripa's status among Tibetans and their international supporters continues to be eclipsed by the Dalai Lama—the 1989 Nobel Peace Prize winner—raising concerns among some of them about who will take over his peaceful campaign for greater autonomy within China after his death. Tibet's parliament-in-exile in Dharamsala has urged the Dalai Lama not to retire, but he appears determined to enhance the authority of the next Kalon Tripa, who is due to be elected this month, both to govern the 145,000-strong refugee community and, if necessary, to negotiate with China. "As early as the 1960s, I have repeatedly stressed that Tibetans need a leader, elected freely by the Tibetan people, to whom I can devolve power," the Dalai Lama said Thursday in an annual speech marking the anniversary of the failed 1959 uprising. "Now, we have clearly reached the time to put this into effect," he said, adding that he would propose a formal amendment to the constitution at a meeting of the parliament-in-exile on Monday. "My desire to devolve authority has nothing to do with a wish to shirk responsibility. It is to benefit Tibetans in the long run. It is not because I feel disheartened." Beijing denounced the Dalai Lama's move. "For years he has been expressing his intention to retire. We think these are tricks to deceive the international community," said Foreign Ministry spokeswoman Jiang Yu. The Dalai Lama's remarks came three days after one senior Chinese official disputed his right to choose his own successor, and another confirmed that Tibet would be closed to foreign tourists during the coming anniversary of violent anti-Chinese riots in March 2008. Behind the statements from both sides lies a historic struggle for the future of Tibet, which Beijing considers to have been an integral part of its territory for hundreds of years, but which the Dalai Lama says had been a de facto independent state for centuries until the Chinese Communist takeover. Since Mao Zedong's forces took control of the region in 1951, Beijing has tried in vain to crush Tibetans' reverence of the Dalai Lama with a series of brutal political campaigns, and massive state investment into the region in recent years. Although the Dalai Lama appears to be in good health, both sides are now preparing for his death, which some experts fear could cause the Tibetan movement to fragment, with some splinter groups advocating the use of violence. Tradition dictates that the Dalai Lama should be replaced by his own reincarnation—identified by senior lamas who interpret signs after the last incumbent's death and then search for promising boys and give them a number of tests. The current Dalai Lama—who is the 14th—was born into a farming family in eastern Tibet and was identified at the age of two after he passed certain tests, including identifying his predecessor's rosary. However, many exiled Tibetans fear that this process would leave them leaderless while the next reincarnation grows up, and open the door for the Chinese government to appoint its own rival Dalai Lama. In 1995, when the Dalai Lama recognized a young boy in Tibet as the new Panchen Lama, the second-highest figure in Tibetan Buddhism, Chinese authorities detained the child and appointed their own candidate. The Beijing-appointed Panchen Lama is dismissed as a fake by many Tibetans but is often quoted in China's state-controlled media praising Chinese policies in Tibet. "The Tibetan people now enjoy religious freedom and are much better off," he was quoted as saying by the state-run Xinhua news agency this week, during a meeting of the Chinese People's Political Consultative Conference, an advisory body of which he is a member. "People can freely choose to start a business, study or become a Buddhist monk. They are free to do whatever they aspire to, which was impossible in old Tibet. The peaceful liberation of Tibet has made people the real master of Tibet." The Dalai Lama has proposed several alternative succession models, including holding a referendum on whether he should be reincarnated at all among the world's 13 million to 14 million Tibetan Buddhists. He has also suggested he could identify his own reincarnation—who he says could be a foreigner, or a woman—while he is alive, even though no Dalai Lama has done so before. Another proposal is for him to appoint the Karmapa Lama—the third-highest in the Tibetan Buddhist hierarchy—as a regent to lead the movement until his successor is old enough to take over. But the Chinese government also appears determined to control the succession process, claiming repeatedly that it alone has the power to certify reincarnations of Tibetan Buddhist lamas, although Communist Party members are supposed to be atheists. Padma Choling, the ethnic Tibetan appointed by Beijing as governor of Tibet, said Monday that the Dalai Lama had no right to abolish the institution of reincarnation. "I don't think this is appropriate. It's impossible, that's what I think," the former soldier said on the sidelines of the annual meeting of China's parliament, the National People's Congress. "We must respect the historical institutions and religious rituals of Tibetan Buddhism," he said. Zhang Qingli, Tibet's Communist Party chief, also confirmed Monday that foreign tourists were temporarily blocked from visiting Tibet, although he said that was due to the "cold winter," a slew of religious activities and the limited number of hotels. “Today, on the 52nd Anniversary of Tibetan Uprising Day, we honor the many brave Tibetans who have sacrificed their lives fighting for freedom. We remember the Tibetan people who peacefully assembled to call for an end to harsh Chinese rule – and we recall the ensuing crackdown that devastated Tibet and forced His Holiness the Dalai Lama into exile. “The Tibetan people have accumulated legitimate grievances from decades of heavy-handed Chinese government policies in Tibet. Tibetans have been economically marginalized in their own land, imprisoned for peaceful expression, and barred from the free practice of their faith. So powerful is the image of the Dalai Lama that Tibetans are imprisoned for simply owning pictures of him. “It is a tribute to his extraordinary commitment to democracy that His Holiness the Dalai Lama recently announced that he will voluntarily hand over his last governmental responsibilities to the democratically-elected leadership of the Tibetan Government In Exile. The bond between the Dalai Lama and Tibetans is unbreakable, and attempts by the Chinese government to dictate Tibetan Buddhist teachings and drive a wedge between the Dalai Lama and the Tibetan people will continue to be counterproductive. “We continue to call for the release of Tibetan political prisoners of conscience including Gedun Choekyi Nyima (the 11th Panchen Lama), Dhondup Wangchen, Tenzin Delek Rinpoche, Norzin Wangmo, Runggye Adak, and many others who are imprisoned for exercising their right to free expression. Tibetans living in exile around the world will go to the polls later this month to choose a new Prime Minister - for the Tibetan government-in-exile in Northern India. The Dalai Lama escaped from Chinese-ruled Tibet to Dharamsala, in northern India, in 1959. Since then, Dharamsala has been the site of the Tibetan government-in exile. Over the years, the Dalai Lama has worked to hand over more and more of his political role to a democratically-elected prime minister. On March 20, Tibetans in exile will directly elect a prime minister for the third time, along with members of the 15th Parliament-in-Exile. In October, 60 percent of Tibetan exile communities voted in primaries, resulting in three runoff candidates for prime minister. 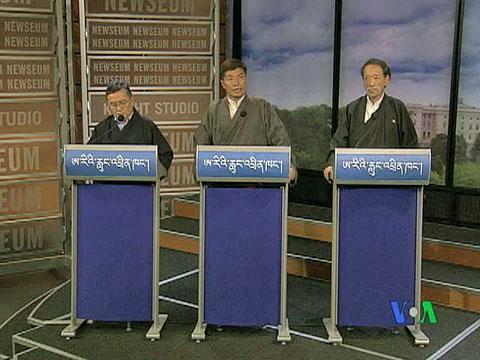 Those three candidates held the first-ever televised debate before an audience of exiled Tibetans. The broadcast will be seen in Tibet and worldwide on the Internet. The leading candidate is a Tibetan-American affiliated with Harvard University. Lobsang Sangay grew up in a Tibetan settlement. He is a Fulbright Scholar with a law degree from Harvard. “The number one problem obviously is how to solve the issue of Tibet so that we can regain our freedom and then the divided family members from inside and outside Tibet can be united in Tibet,” said Sangay. Tenzin Tethong is a former representative of the Dalai Lama in New York and Washington. Currently, he is a Distinguished Fellow at Stanford University. “The most important responsibility for the exile government is to work for the cause of a free Tibet and for the rights of the Tibetan people,” said Tethong. Tashi Wangdi has run a half-dozen of the government-in exile’s departments over the years. Most recently he represented the Dalai Lama in Europe. “It’s very important for us to see what we can do to survive as a Tibetan people in exile and be able to maintain our identity and continue the struggle until we find a solution,” said Wangdi. By August, Tibetans-in-exile will have a new prime minister. It’s a choice than many are considering very seriously.